I have to thank Ceinwenn for this topic. He or she (I can’t be sure, since the link takes me to a password protected forum) commented on my previous post, Three Requirements of a Book Review (?). Ceinwenn felt I had given away too much plot info in my review of David Baldacci’s First Family. It’s entirely possible. Several comments mentioned avoiding spoilers, something I have not considered as much as I will now. In my own defense, I would cite the similarities of a synopsis, which you use as a design and advertising tool with your own fiction, and the plot exposition section of a book review. In a synopsis, you must reveal what happens; you can’t leave an agent or editor guessing. In a book review you must not. Got it. Thanks. But that wasn’t what I really wanted to talk about here. Ceinwenn’s comment spun me off thinking of several recent things I’ve said about blogging, and specifically my discovery that the public act of blogging is far more stimulating than the private act of writing in a journal. The public nature of blogging makes it challenging in terms of deciding how much self-revelation is right. My wife has commented on my tendency to get too academic and boring, which is an easy path for me to take. On the other hand, I remember a psych teacher who was Mr. Sensitive-Self-Revelation, and it wasn’t a pretty sight! A remember a very calm and poised young woman walking out of the class, shaking her head and making barfing noises. You get what I’m saying. As a blogger I want to be real and I enjoy the same quality in others, but I’ve used the delete key on posts that went to far. I might write about an embarrassing moment, especially if there is humor involved, but I’m probably not going to post my most mortifying-ever experience. You know the one – you’re driving along and it comes to mind and you slink down in your seat in case the nearby drivers can read your mind. Some topics rouse caution immediately, notably politics and religion. Mary and I have a couple of long-term friends that are long-term because we learned early on to stay off these topics. Here on this blog I circle both politics and religion, but I keep more of a distance than I would personally like to. Still, because I really dislike door to door religion or candidate salespeople, I don’t want to risk using this space to invade anyone’s right to decide for themselves. Fortunately, tonight I get to quote someone brilliant on a political topic. I’m traveling. As a matter of fact, I’m attending a two day intensive teaching session let by a Tibetan Buddhist teacher of international renown (forbidden topic #1). I got back to my room and flipped on the news just in time to see the President’s message that a compromise is in the works. (forbidden topic #2). Whew! No one with their head screwed on right could wish to see our country in default, and yet, the whole situation is icky! Have you ever gone for a swim in a lake or river that was too full of alge? You come out feeling slimy. It’s far to easy to blame someone else, but none of us are innocent in this mess. We elected these clowns, most of whom are doing what they think we want them to do in order to get re-elected. It cuts a lot deeper than that, and once I get home, I may quote from an article I found that has a lot to say about this dance of the public and the politicians. 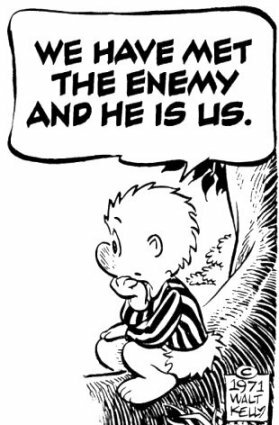 Meanwhile, here is the brilliant comment I promised, from Walt Kelly, creator of the wonderful comic strip, “Pogo.” This particular panel was printed in 1971, on the occasion of the first Earth Day, but its message took on a life of its own that goes beyond any single issue. If we could learn one thing from this latest crisis, this would be my vote. We, as a nation, will not be destroyed from without, goes the common wisdom, often repeated over the last decade – but clearly we can do it to ourselves. This entry was posted in Blogging, Book Reviews, Current Events, Economics and tagged blogging, book reviews, Culture, current events, economics, postaweek2011, religion, Tibet. Bookmark the permalink. 5 Responses to How Much is Too Much? Pogo — my favorite philosopher. He got it right. Vigorous writing is concise (William Strunk). Your writing is not. Advice: Do not take another blog class until you take a class in syntax and punctuation. Ceinwenn is a “she”. Good post & thanks for pointing out my Gravatar link wasn’t working – it was supposed to take you to my blog, not to my forum….all fixed now!